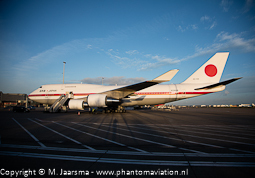 On January 9 Japanese Prime Minister Shinzo Abe arrived at Schiphol for a visit to his Dutch colleague Mark Rutte. 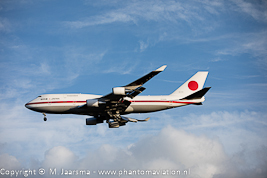 As usual with these visits the Japanese Air Self Defence Force (JASDF) arrived with its two Boeing 747s. 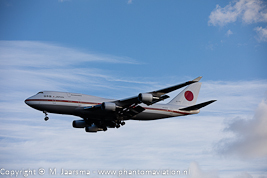 The visit marked the last time both aircraft could be seen in The Netherlands. The special airlift group within 701 Hikotai based at Chitose air base on Japans northern island Hokkaido is in the process of transitioning to the new Boeing 777 of which two have been bought. They are expected to take over the special airlift missions in the second half of 2019. Both B-747s served for more than 25 years. When flying the Japanese prime minister of emperor the aircraft depart their home base to Tokyo Haneda from where they take-off to their destination. The flight to Schiphol took between 11-12 hours with the first aircraft arriving around 14.50LT and its colleague about 25 minutes later. A day later prime minister Abe left for London for a meeting with Theresa Mary May the Prime Minister of the United Kingdom. Both aircraft were parked on the Romeo ramp, stand R72 and R74.